Not about to be outdone by Seven’s House Rules renewal, Nine is also calling for contestants for a 2014 season of The Block. 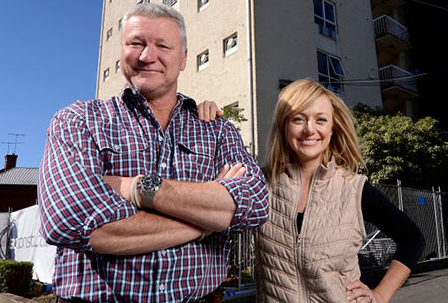 “We are looking for enthusiastic, motivated, hardworking teams of two to participate in Australia’s favourite renovation challenge,” says a casting website. Couples must be aged between 18-65 and be available for a 10 week shoot from November to January. First round couples will also be reduced to final participants in the first week of filming. Closing date for entries is midnight Sunday August 18. Nine is yet to formally announce a new series including its location. If channel 9 has more money than seven then why was it on the verge of bankruptcy. Scotty’s voice over last night mentioned the next series being bigger with more surprises (the usual blurb), so I guess that’s as official as it gets in the wake of House Rules announcing a second series. I would have thought a return to more simple times (as in series 2) with a fixed budget and no challenges (how lame were the monkey and go-cart ones?) would keep their ratings from sliding next year. They forgot “must be white and annoying”. 18-65? LOL. Yeah right. Try 40 at the most, white and straight.